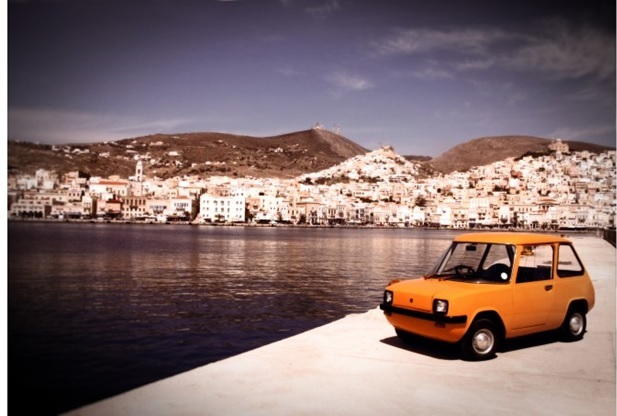 More than forty years ago, long before Elon Musk and Tesla, there used to be a small electric car that was produced in a Greek island: The Enfield-Neorion 8000. Who would knew? Many people surely won’t believe that Greece produced cars, let alone electric ones. But Greece was indeed producing cars in the near past, before Euro unification, that were mainly foreign designs assembled under license. The main such producers were ELBO (or ELVO, fka Steyr Daimler Puch – Hellas) with military and commercial vehicles , a company that still exists today, TEOKAR-Theocharakis that assembled Nissan models between 1980-1995, before the UK Sunderland factory was established and NAMCO that produced a very popular light commercial vehicle derived from Citroën 2CV called Pony (around 17,000 Ponys were built between 1972-1992 and the company is still active and trying to restart production if it gets state approval). There were also a few less well-known, smaller producers. 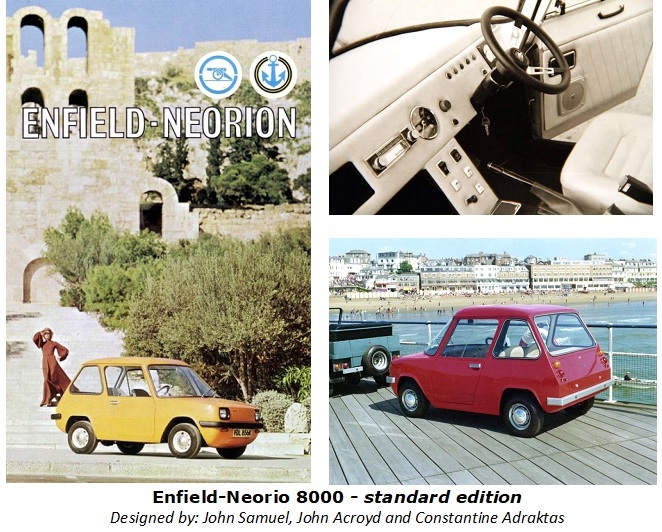 The Enfield-Neorion 8000 was developed in the early 1970’s by Enfield Automotive, a British company with history in production of rifles, motorcycles and boats (hence the canon in its logo). The motivation behind its development was a competition set up by UK’s Electricity Council which Enfield won over Ford and Leyland designs (the latter was producing the popular Mini at that time). This prototype was then redesigned for commercial launch (the prototype Enfield 465 was a 2+2 seater with plastic body and sliding doors features that were not retained). Probably the daft decision to launch must have been motivated by the oil crisis of the time. Enfield was owned by the Greek shipping mogul John Goulandris. After production was proven too expensive to be carried out in England (due to salary raise demands amid an era of labor protests; by the way isn’t it strange how such demand happen when something ambitious is under way? same thing brought down the Pony production in Greece, can’t help draw parallels..). 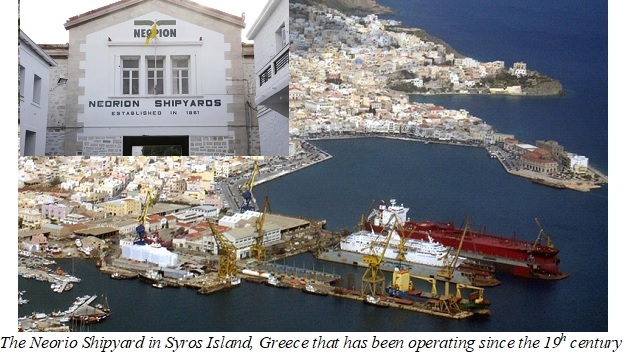 In any case, Goulandris decided to move production to the Greek island of Syros where he owned the Neorion shipyard (hence the Enfield-Neorion name). This move might not have been as crazy as it sounds to the unbeknown. Shipyards are a key heavy industry of Greece (yes there is some heavy industry in Greece, even less so today, and it’s got nothing to do with tourism, contrary to an unfortunate if not mischievous saying of populists politicians…). Syros also had a long industrial background. Greek shipyards of which there are a few, have built railcars, commercial vehicles and other machinery apart from ships. Shipyards are at the core of technological and industrial groups in other countries too, such as in Japan (Mitsubishi), China (CSSC) and Korea (Huyndai). Greek shipyards possess ample experience in welding and engineering and also significant work floor facilities; after all the Greek owned commercial fleet is among the largest globally and use them regularly. A specialized car factory was set up with the equipment moved from England. Shipyard staff transferred there had to be trained while additional auto workmen were hired. What the staff lacked in experience they made up by enthusiasm for what they were going to produce. Production started in late 1973 and lasted until early 1976 when it was discontinued. During this period around 120 cars were produced. Almost half of them were purchased by the Electricity Council in England and the rest were sold around the world to various individuals that must have been quite eccentric for the time, more so than the initial Tesla owners. That is because the car had limited capabilities being strictly a city car and its price was 2.5 times that of a comparable sized vehicle such as the popular Mini (2,800 GB pounds). And off course environmental sensitivities should have been running much lower than today. The car was made with aluminum panels for anti-corrosion protection and lighter weight (which eventually was not that small considering the humongous batteries of the time). It could carry two passengers at a maximum speed of 40mph (with only 8hp engine power which however was tested to cope with the challenging terrain of the Greek island). It had a range of 35-55 miles depending on driving conditions. It used components of other cars (brakes and suspension) to reduce development and production cost. It could be recharged at a typical household 220V power outlet. The production was organized in a rather atypical setup for the time, utilizing, we may say, lean production techniques that were later introduced by the Japanese in the ‘80s, revolutionizing car manufacturing. In this setup there were six independent teams, each one producing a complete car. They used wooden molds, some presses and machine tools but mostly parts were handmade and assembled manually. Production in a way resembled that of a custom car and as a result it was slow and expensive. Probably it was a stepping stone until the company had large orders to move into a larger scale production. In any case by using the numbers produced during this time, one can estimate that on average it took a bit more than a month to produce one car. Maybe the actual cycle was not that long considering the learning curve as well as some downtimes and parallel activities such as the production of a couple more prototypes. Somewhere it is mentioned that producing a car took a week. Still that is a lot, considering that it took just a couple hours for a Ford Model T, the line production champion, many years before or the typical lean production cycle of around 20 hours or so in the ‘80s. So it was not an efficient process by any means and resulted into loss making albeit unknown by how much. It is also not known whether that is due to the labor component, it shouldn’t have been that high, or the material one. Reportedly, components were expensive and their cost did rise during production, while there were also logistical problems as production was based at an island where materials were shipped from England through Greek customs and then transferred back to the Isle of Wight, for some reason, for battery mounting before being delivered to buyers…. So over all there were many inefficiencies that could have been avoided in another setting. Apart from the typical 8000 version (produced in bright colors (white, orange, blue, yellow) a couple more versions were designed but didn’t go into production; the open top (Bicini), the buggy (Olympic Airways version; Olympic was owned by another Greek shipping mogul Onassis, at the time) and the van (Miner). As only around 120 cars were produced those that exist today are extremely collectible. However it would be a pity to be treasured for that and not for the technological breakthrough they represented. If you are curious to see one, there are some in Greece at the Industrial Museum of the island of Syros as well as at the Hellenic Motor Museum in Athens and lately at the Hellenic Motorcycle Museum. These cars were recently acquired from collectors after some interest in the car was ignited through a 2014 documentary “A TALE OF TWO ISLES” by Michalis Stavropoulos. Indeed a very entertaining documentary. It would probably make a great movie too, one about visionary owners, passionate designers and employees, conflicting interests and challenging market conditions that were not ripe for the time. Indeed it was too far in front of its time; even Tesla some years ago was mired with doubt. And there are the usual conspiracy theories about the oil industry’s reaction. John Goulandris allegedly believed that a car that was owned by Greeks, and designed by Greeks should also be produced in Greece. Romantic. 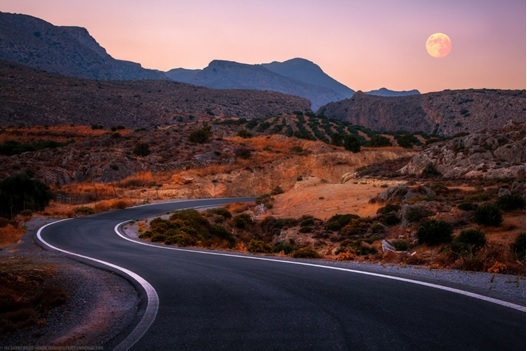 And even if so, it was not even possible for the car to be driven in Greece… due to licensing obstacles by the Greek state. How strange is that? Bureaucracy is the easy excuse (“bureaucracy” is what you call when the establishment doesn’t want to do something and uses excuses to slow things down; on the other hand “corruption” is what you call when it wants to do something by all means…). A more realistic view however of Enfield’s General Manager was that the car had to be produced where it was sold and where the know-how and suppliers were located. There was some interest to move production to the US for example, when Ronald Reagan was the California governor and showed some interest in it. Three cars were actually sent to California for that (an idea was floated to be used by residents of the Santa Catalina island). Probably this option wouldn’t have gone far either judging from the fate of GM’s Electric Car. How about bringing the Enfield-Neorion 8000 back to production? My idea would be to use it primarily as rented car in the Greek islands or other such environments and in the cities (could be used by ride-sharing startups). The car could fit well and support the Greek tourist brand (same as the distinct image of NYC or London cabs) and offer low cost operation (hopefully) and easiness to service (both in terms of standardized know-how and access to spare parts). High speeds are not necessary in the islands, if not avoidable (50km/h is more than enough) and a 70 km range could give a couple of days of use without recharging. Off course a release for the Greek public could be possible too. There is recently some nostalgia as well as discussion over ways to increase manufacturing in Greece and help the economy out of the debt crisis. There are also some other advantageous market conditions. Environmental sensitivities are high now and subsidies are provided for electric cars. Countries such as France have announced their intention to move into all-electric cars by 2040 and research on electric cars is increasing. There are technological advancements in batteries (Tesla is working on bringing down cost) and there is even possibility for wireless charging even while moving. There are also ongoing initiatives for sustainable development and energy sufficiency in small islands in Greece (so called Green Islands such as Tilos. There is also ample renewable energy in the islands (solar, wind, wave, geothermal, biomass and other). I’d believe that the car wouldn’t need to change much. The existing design would suffice (even though some new designs have surfaced). I think that the original design is amongst the car’s strong points as it gives it a distinct character with simplicity and elegance, let alone that it is aerodynamic. Why change a good thing? Some additions in safety (such as airbags?) and comfort may be needed though. But not many probably, as this would be a drag on energy consumption (ie air-conditioning). In the end of the day if we are talking about summer holidays or city traffic you just want to get from point A to point B quickly and park easily plus at low cost. It’s also much safer and comfortable for the majority of people compared to the scooters that are rented in the islands or even worse the unstable 4-wheel bikes. It is also the same size as other popular mini models (the Smart is probably smaller). Improvements in batteries would also be useful if not necessary and by that, range and speed could be improved. There are actually already owners (collectors) that replace the heavy original lead acid batteries with lighter lithium ones. It is also possible to upgrade or replace the motors. Actually there is a car enthusiast and presenter in England (Johny Smith) that installed an 800 hp motor giving it a 140 mph (1-60 miles in less than 3 sec) albeit with serious reinforcements in moving parts, brakes and stabilizers to handle the torque (see Flux Capacitator ). One wouldn’t advise something like that but what’s more astonishing, is that this particular dragster-type car can be driven legally in the UK! 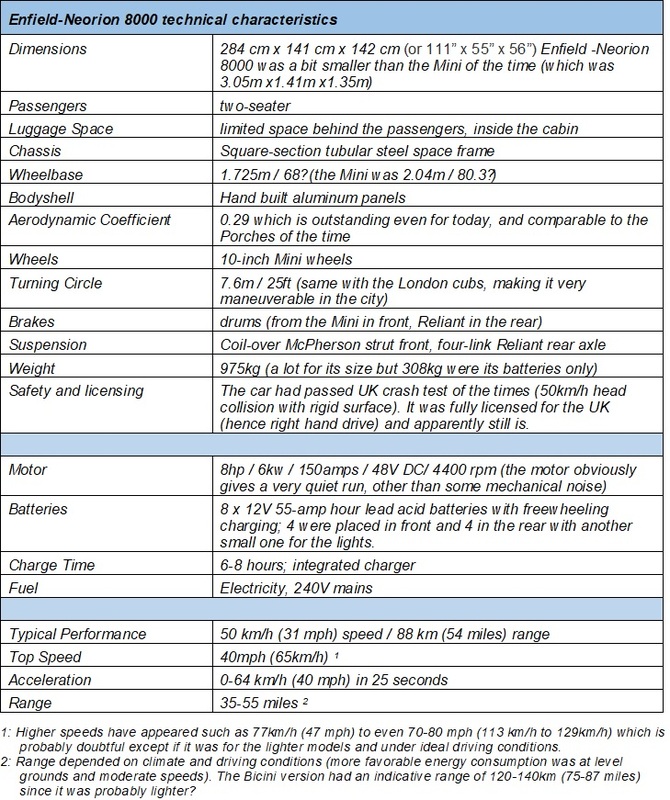 So there’s room for improvements…..On the other hand one could just install some software that would measure 100mph top speed and 250 miles range when wheels not moving something like the #Dieselgate case. Ok, that’s a joke and probably the #ElectricCar wouldn’t get away with it but you got the hint…. Some more production parameters: a lot of positive ones.. Rented car in the Greek islands. Let’s assume that the rent-a-car fleet in Greek island is around 10,000 units and most of that could be claimed. The usual life of rented cars is 7-8 years or less. Domestic car market: even if it has been decimated during the debt crisis to below 100,000 units per year or one third of its highs). However most of the cars are located in Athens which is a congested city. The Greek public has also turned to smaller and more economic cars because of the loss in purchasing power. Other markets and niches outside Greece with the same characteristics could be export or co-location candidates as well. Cost and Return: Now the difficult part. I can’t say what the production cost can be and neither the return… But if somebody is interested then it can be studied. I can see though that there’s significant room when it comes to retail price. Small electric cars (Nissan Leaf, BMW i3 sell for well over 30,000 Euro and are subsidized by as much as 25%). Probably one would aim for a much, much lower price to fit with the car’s modest design and at the same time spur demand in the recession stricken Greece. Obviously it would be very difficult for one to compete with top of the range models of established manufacturers. Set up production: Apart from facilities and staff, one would have to find the molds or make new as well as select new components and suppliers (brakes, transmission, motor, batteries, suspension) or reproduce old ones (if possible). Also create procedures and train staff (some automation would be probably needed too). Licensing: Greece is now part of the EU so vehicles have to abide with demanding EU regulations (which is actually a problem and the main reason blocking the return of the Pony model back to production). It’s quite unfortunate if this turns to be impossible to overcome as now local production in Greece is necessary to create jobs, add value and take the country out of recession with the ability to repay some of its debt. By closing, as much as this might sound as a crazy idea, it is still a tempting one. Isn’t it? Imagine how much more unlikely or risky it was back then. One can’t help admire those people courage (although some might see it differently). Drawing some parallels and putting it into today’s era the story would have gone like this: the young entrepreneur gave up his established line of business to take a bet on this innovation that poses a major disruption in the market. In a gutsy move and contrary to all odds has managed very quickly to put together a team of gifted engineers and motivated staff at a remote island location for this purpose. They are aiming for product launch within a year, something that would be an unlikely achievement on its own. Round A financing is secured through own funds. Once proof of concept is established this startup will definitely be the next unicorn with an estimated market in the billions of dollars globally. Current order book includes more than 100 orders from around the world. But now we are not in the 70s and people may more easily throw money in some obscure startups and look at this car with disbelief. And there are not so many Elon Musks’ around. Still something like that can inspire people and offer a platform for research for universities and technical schools. Let alone the environmental angle. At least, the writer can speak from his own experience as cars were the motivation to pursue mechanical engineering. And eventually this can provide much needed jobs in Greece (directly and indirectly) and if it is proven so, some profits for its owners too and the economy. Who could be up for such a journey though? By Pete Chatziplis, CFA, ACCA, MBA. The articles published here do not necessarily reflect the views of the Transatlantic Business Forum. The writer has no relation to the companies and persons mentioned here. Information is based on publicly available information and comments or correction are welcome. This entry was posted in Business Cases, M&A Markets and tagged Electric Car, Enfield, Enfield-Neorion 8000, Goulandris, Greek Crisis, Greek Economy, Greek Innovation, Investing in Greece, προστασία περιβάλλοντος, περιβαλλοντική πολιτική, Βιομηχανία Ελλάδας, Γουλανδρης, Ελληνική τεχνολογία, Νεωριο Σύρου, Οικονομική Αναπτυξη, ανανεώσιμες πηγές ενέργειας, ανεργία, ερευνα, ηλεκτρικό αυτοκίνητο, οικονομική κρίση, Neorion, Renewable Energy, Syros. Bookmark the permalink.